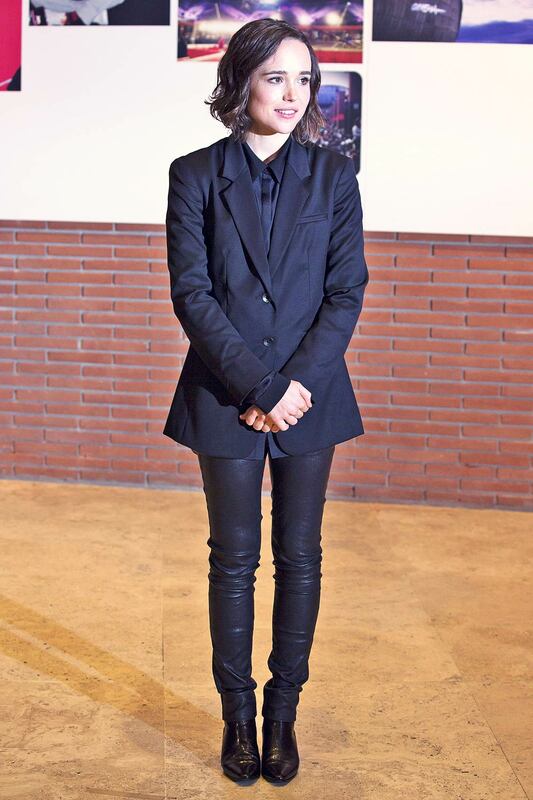 Actress Ellen Page looked sophisticated as she attended 10th Rome Film Festival Freeheld Screening at Auditorium Parco Della Musica in Rome on October 18, 2015. The 28-year-old chose to wear an all-black classy ensemble consisting of skinny pants, a shirt and a coat. Ellen looked as graceful as ever in black leather skintight pants, showing off her legs, paired with a matching shirt and a smart coat. She slipped her feet into a pair of black leather chunky boots to add a few inches to her height, and kept her look really simple as she decided not to wear much accessories. Her short locks were styled in edgy waves, while she sported natural makeup look, finishing out the look with few swipes of mascara, peach blush and a slick of peach lipstick. Even without much accessories, Ellen looked absolutely gorgeous. We love her look!